Too much has been written about making money online, and too little that is any good. Here is something that is more than just another book on internet marketing, or trying to make money online. This is a step by step guide for anyone who wants to make money from home, or expand their business using the potential of the internet. This book takes you by the hand and explains what you need to do, why you need to do it and how to go about it. There is a range of useful links that alone will save you hours of trial, error and research. To top it off it also come complete with free online training worth $500 that will visually show you both the what, and the how in video format. - How ordinary people make extraordinary money: Millions of people try to become successful every year. Most give up. Learn the one unspoken truth to success (or discover it alone the hard way). - 5 Ways to getting an ebook written for you: Need to build authority? Want a product to sell? Need a lead generator? Don't like writing yourself, or have no time? Then learn 5 different ways to getting the hard work done for you, some without spending a cent. - The art of email copy, and 7 tips to getting your emails opened: Discover easy ways to write profitable emails, even if you have never written copy in your life. - 4 Essential questions you must answer if you want to make a sale: Miss any one and you will be losing money. - 5 Psychological tricks to get people to buy now: People all too often don't buy what could have benefited them. They miss out on great opportunities every day. Don't let them miss yours. - 24 Advanced conversion strategies: These tips alone will be worth thousands of dollars to your business. These are the same principles used to create a 9.28% conversion rate on a $997 product. - So much more: This book is jammed from beginning to end with information that you can start using today. This is a bible for online marketing. Whether you are just starting out, or simply have been struggling to long then look no further. 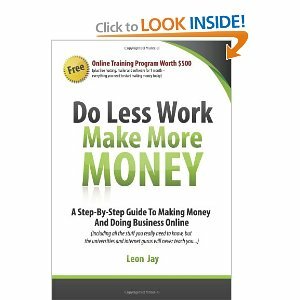 Do Less Work, Make More Money is exactly what you are looking for.